Despite all the differences between them, there are some things that men and women come together on. Martinis. Billy Joel. A good pillowtop mattress. The Mini, of course, wasn’t always made by Bavarians who specialize in four-wheeled Viagra capsules. Originally, the car hailed from Great Britain, where it was designed and built in response to a late 1950s fuel shortage as a way of getting maximum space from the minimum car. The original Mini was a good deal smaller than today’s, maxxing out at just 10 feet long – two feet shorter than today’s Mini. While indelibly linked with the swinging ’60s, thanks in part to a role in the 1969 film The Italian Job, the old Mini continued in one form or another all the way until the year 2000, at which point BMW (owners of the Rover group – the same people who make Land Rovers – since 1994) decided to sell off the cash-hemorrhaging Rover brands. However, it held onto the Mini name, relaunching it as an entirely new car in 2001 and forever linking it to the retro-crazed 1990s/2000s, thanks in part to a role in the 2003 film The Italian Job. The base model sold in the States is the Cooper, which comes with a 1.6 liter, 118-horsepower four-cylinder engine and a choice of 6-speed manual or automatic transmission, a rarity among small cars; either way, the Cooper returns about 37 miles per gallon on the highway and 28 in the city. Anti-lock brakes, a full suite of front-side-and-curtain airbags, keyless entry, CD stereo, and a climate-controlled glovebox for keeping drinks cold/preserving fragile archaeological relics all come standard, along with an options roster longer than John Goodman’s shopping list. The base Mini starts at $18,700, but expect to see that rocket upwards once you start tacking on things like Keyless Go, sonar parking sensors, or a navigation system. Above the Cooper lies the Cooper S, whose primary distinction from the base Mini is the turbocharger strapped to its 1.6 liter engine, boosting power to 172 horses and cutting the 0 to 60 time down by almost two seconds. Torque is increased from 114 lb-ft to 177, available at a much more useable 1600 rpm. However, gas mileage takes a beating, dropping to S models are best distinguished from their base brethren by the scoop in the center of their hoods. In terms of features, the S adds traction control, foglamps, a small rear spoiler and aluminum pedals (ooh!) 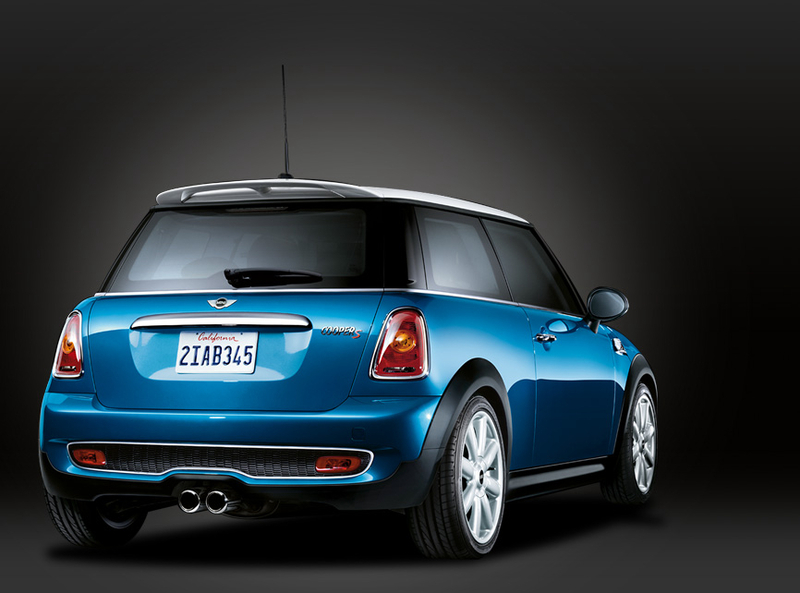 Again, leave off the fancy options, and a Cooper S can be yours for $21,850. For those of non-Irish origin, the Mini also comes in convertible versions of the Cooper and Cooper S. Unlike most convertibles, the Mini’s top offers an intermediate sunroof position that lets you be blasted with UV rays without messing up your hair. (It’s really more of a targa top, but Mini might well have feared 1980s Z28 IROC associations with the T-top moniker.) Of course, the top fully stows in the back, as well as sealing up against the weather. 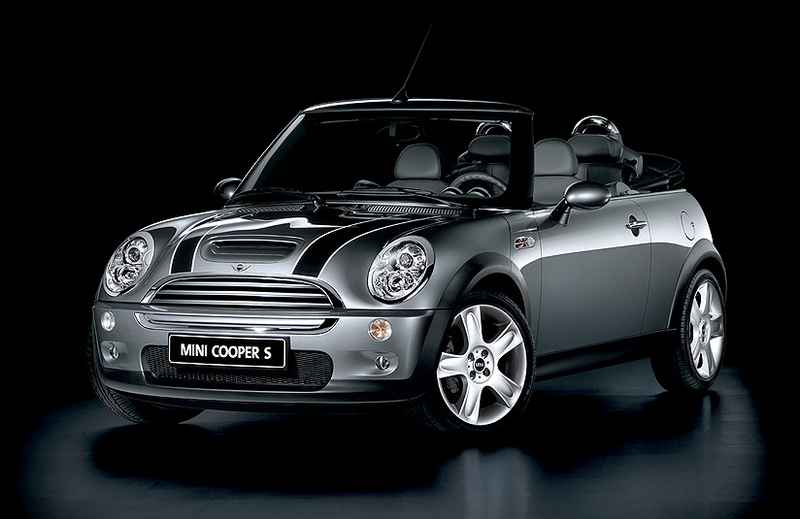 The Cooper convertible has not been updated to the second-generation body and powertrain as the regular Mini has. Power and torque drop by three each; 0 to 60 times lose four-tenths of a second, and fuel economy falls to 23/32 city/highway, mostly due to the convertible’s added weight and the fact that the manual transmission only has 5 gears instead of 6, and the automatic is of the continuously-variable variety instead of the 6-speed. Otherwise, options and standard features tend to be the same as in the hardtop Cooper, with the exception of those changes mandated by the folding roof. The Cooper S convertible makes do with the old supercharged 1.6 liter four-cylinder; the engine makes 168 horsepower and gets 21 mpg in the city, 29 on the highway. A 6-speed manual is standard, a 6-speed automatic optional. 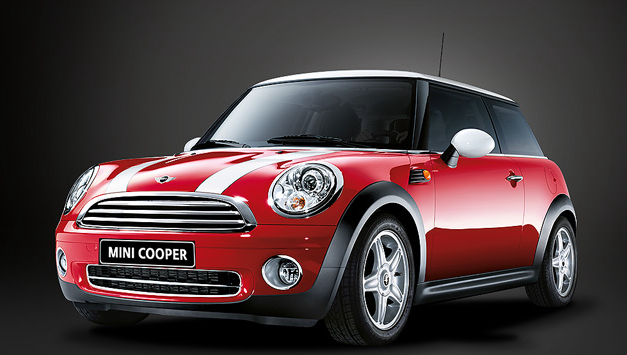 Cooper convertibles start at $22,600, while Cooper S convertibles begin at $26,050. 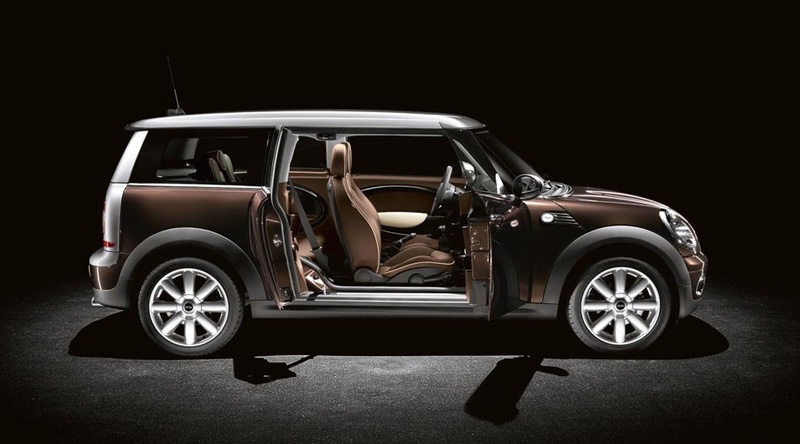 The newest addition to the Mini family is the Clubman, a stretched version of the Cooper. 9.4 inches of added length give the Clubman room for a half-door along the right-hand side of the vehicle and allow actual-sized humans to sit in back without eating their kneecaps. It also comes with two horizontally-opening rear doors, instead of the regular Mini’s hatchback, for apparently no reason except to be different. The base Clubman model is pretty much identical to the Cooper, other than the added space; fuel economy and power output is the same, and acceleration suffers by four-tenths of a second, again due to added weight. Dynamic stability control also comes standard on the Clubman; in addition, the rear seats fold flat, making transport of large items easier. Base Clubmen start at $20,600. The Clubman S, as you might imagine, just takes the Cooper S and sticks a few more inches on it. Fuel economy and power are the same; acceleration to 60 drops three-tenths of a second. Again, Dynamic stability control and flat-folding seats come standard, along with a $24,100 pricetag. There’s also a high-performance John Cooper Works edition of both Cooper and Clubman available, with souped-up (208 horsepower) versions of the turbo engine, along with other options. The Works edition of the Cooper starts at $29,200, while the Clubman is the only Mini to break the 30-grand barrier with a base price of $31,450. However, it’s easy enough to push the prices on regular Minis up into heady territory; I configured a Cooper S on Mini’s website, and even without a leather interior, navigation system or automatic transmission, my car listed for $26,850. 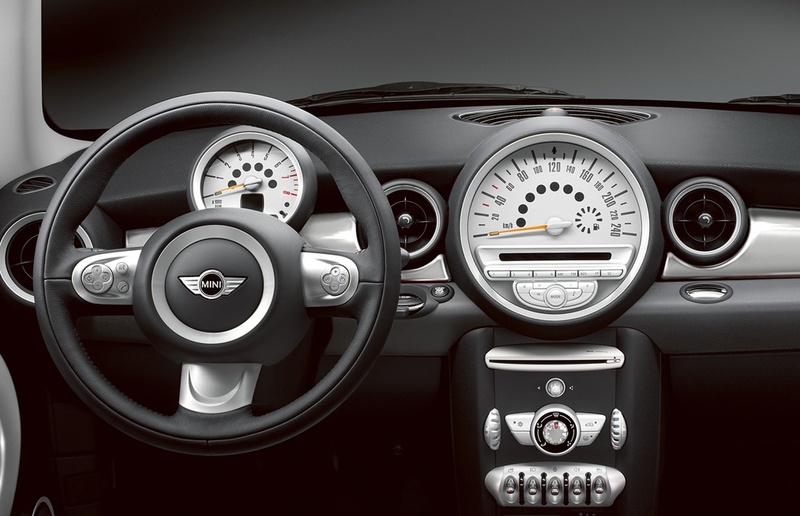 Bottom line: the Mini is a unique car. There are plenty of far more practical rides out there for the same money, and plenty of sportier ones as well. But few cars on the road bring about the same sort of emotional reaction as the Mini. If you get it, you’ll want one despite the cost; if you don’t, you’ll cross it off your list early and never look back. Also Consider: Volkswagen Rabbit, Mazda3, Honda Fit.